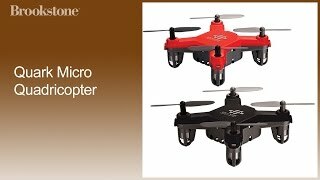 Quark Micro Quadricopter at Brookstone—Buy Now! Super-fun drone that fits in the palm of your hand! Big-time fun in a tiny package. Quark Micro is fun for pilots of all skill levels. With three different speed settings and the ability to perform 360° aerial stunt rolls at the push of a button, this quick little quad is great for beginner to advanced pilots. The included safety training cage makes it even easier for new pilots to learn how to fly! Fly this fun little drone anywhere—inside or out! Quark Micro is small enough to fly around indoors without getting into (too much) trouble, and the 2.4G digital controller has a range of 100+ meters so you can take it outside and fly it so far that you can’t even see it anymore! Order your Quark Micro Quadricopter from Brookstone today! WARNING: For ages 10 and up. This product may contain small parts, which may pose a choking hazard to children. Notice to Register Drones: As of 12/21/15, the Federal Aviation Administration (FAA) requires all owners of drones (Unmanned Aircraft Systems) that weigh more than 0.55 pounds to register their devices at https://registermyuas.faa.gov/. Check your local civil aerial regulation as additional state and/or local requirements may apply. Q: When I need to replace a blade, how do I know which which blade color goes into which position? A: When replacing the propeller blades, make sure to match both the color of the blade and the indication letter on the blade.